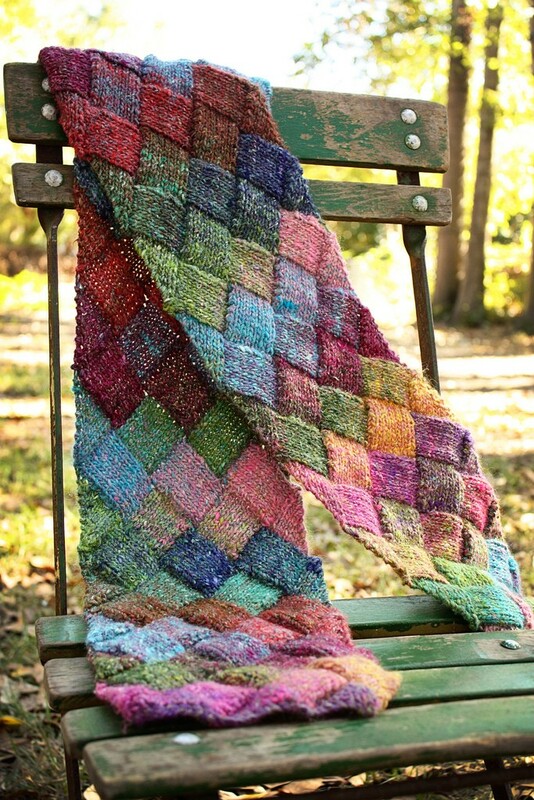 This pattern calls for 4 balls of Noro Silk Garden which produced a scarf 61 inches long and 6.5 inches wide (unblocked). Gauge is not important. If you have questions or wish to discuss this pattern, there is an Entrelac Scarf discussion thread in the Freckles & Purls Ravelry group. Are you new to entrelac? Staci Perry of verypink created a wonderful video tutorial based on this pattern. Download the pattern and follow along with her as she teaches you every step involved in the making of this scarf! One question I get a lot is about the k2togs at the end of the wrong-side rows in the Right Side Triangle. The k2tog decrease in the pattern is the correct decrease (Staci works a p2tog in the above video). The k2tog decrease results in a kind of garter stitch edging along the side of the scarf (almost like little bumps running up the sides). Those little bumps are created in the Left Side Triangle by knitting the first stitch of all of the wrong-side (purl) rows. If you don’t want the garter stitch edge you can purl the first stitch of every wrong-side row of the Left Side Triangle and then do a p2tog at the end of every wrong-side row of the Right Side Triangle. So the choice is really up to you as to which look you prefer, but once you decide on “bumps” or “no bumps”, you just need to be consistent and make that change in BOTH side triangles so that you don’t end up with bumps down one side of the scarf and no bumps down the other!